There are options in Brooklyn on how to party on New Year's Eve to usher in 2019 and then things to do for a more relaxed New Year's Day. Whether you are going out on the town or staying closer to home with the family, Brooklyn, New York is a great place to be for New Year's. 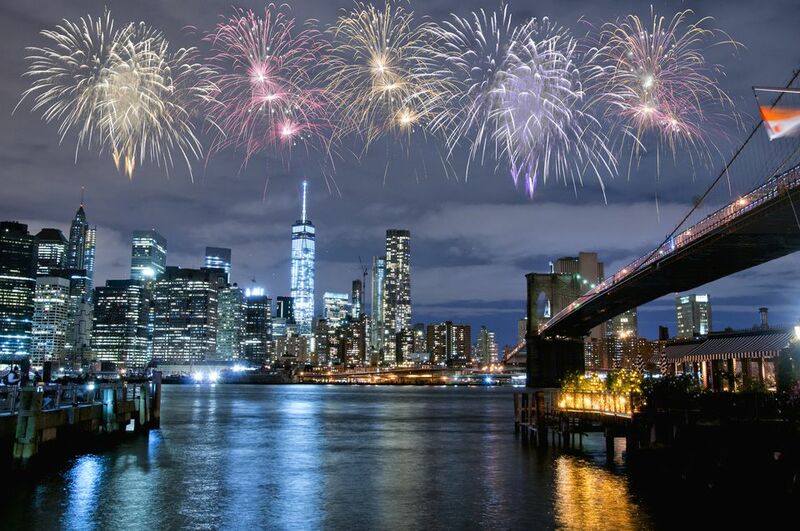 Enjoy the fireworks in Prospect Park, hang out at a local club or walk the Brooklyn Bridge. For New Year's Eve 2018-19, you can enjoy a countdown and fireworks in Prospect Park at the stroke of midnight. Entertainment and hot refreshments are available from 10:30 p.m. to 12:30 a.m. but for a good viewing spot arrive early. Grand Army Plaza, located at the main entrance to Prospect Park, will be a major viewing site for the Prospect Park fireworks, which are shot off in the Great Lawn section of the park. Rather spend New Year's Eve at the beach instead of the park? You can see a midnight fireworks display at Coney Island. Spend New Year's Eve on the iconic Coney Island Boardwalk. The historic Luna Park amusement area will host their annual fireworks display. The celebration starts at 6 p.m., and past events have included extended hours at the New York Aquarium and free rides of the Wonder Wheel. Some restaurants have been open until 9 p.m. Frigid weather will close the rides. The Coney Island Polar Bear Club is the oldest winter swimming organization in the United States, take polar bear plunges on weekends in the winter. On New Year's Day, they do a special plunge accompanied by the hardy from across the U.S.
For those looking for dancing, shows, and music there's plenty happening New Year's Eve in cool, hot, unique Brooklyn. From floor shows in a Brighton Beach nightclub to hanging out at the bars and restaurants in Bushwick, there will be a venue that's your style. Or spend the evening in Greenpoint at the Brooklyn Bazaar and many other cool venues. Some venues will have special New Year's Eve festivities. Walking across the Brooklyn Bridge on New Year's Eve is a fun thing to do. You can do your walk at any time, but there will be fireworks in NY Harbor near Liberty Island at midnight and the bridge provides an excellent vantage point. Also from the bridge, you'll be able to see fireworks off in the distance, for example, those on Staten Island. While you are up there, look for the Empire State Building, which is cast in special hues for the occasion. Also, look for the silhouette of lower Manhattan, the Statue of Liberty, the Manhattan Bridge, the Williamsburg Bridge, the Chrysler Building, and the traffic on East River Drive. Don't want to do it on your own? Join in with a group walking tour. If you want to party like a local on New Year's Eve, Brooklyn has neighborhoods hang-outs to be proud of. So head toward a local sports bar (or one with a big TV), meet some new people, and watch the freezing throngs count down to midnight in Times Square while you're sitting inside, comfy and warm. There are some centrally located sports bars near Barclays Center. For a more upscale experience in the area try out the 40/40 Club with its chic decor and multi-level sports bar and lounge. The name is a baseball term for a record set by only four players in the history of the sport. This record represents speed and strength. Jose Canseco, Barry Bonds, Alex Rodriguez, and Alfonso Soriano became the exclusive members of this record-setting club by hitting 40 home runs and stealing 40 bases in a single season. Reservations recommended. The museum is open until 3 p.m. on December 31st but closed on New Year's Day. This cute children's museum has many interactive exhibits and is a great place to spend the day with young ones. The museum even has a child-sized Brooklyn street with shops they can visit, a sensory play area, and Color Lab. After the museum closes, head to Franklin Avenue for a bite to eat. You can't get more Brooklyn that a New Year's Eve at the Brooklyn Brewery. In past years, the event featured an open bar with 21 different beers, barrel-aged releases, and an unreleased ghost bottle as well as music and tasty snacks. Watch the brewery Facebook page for this season's events. Don't wake up after New Year's Eve without a plan for New Year's Day. Even if you expect to be nursing a hangover, you can probably manage brunch at, say, 3 P.M. Many Brooklyn restaurants don't take reservations, even on holidays, so you can take your chances like everybody else and just head toward your favorite place and wait in line. But if you want to book ahead, here are a few good places to get a reservation for brunch on New Year's Day.